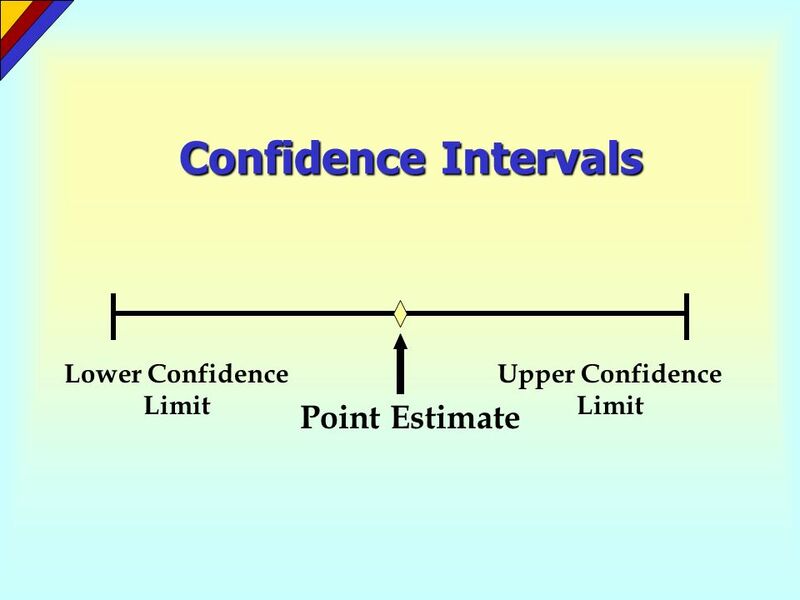 After studying the material in this chapter, you should be able to: Distinguish between a point estimate and a confidence interval estimate. 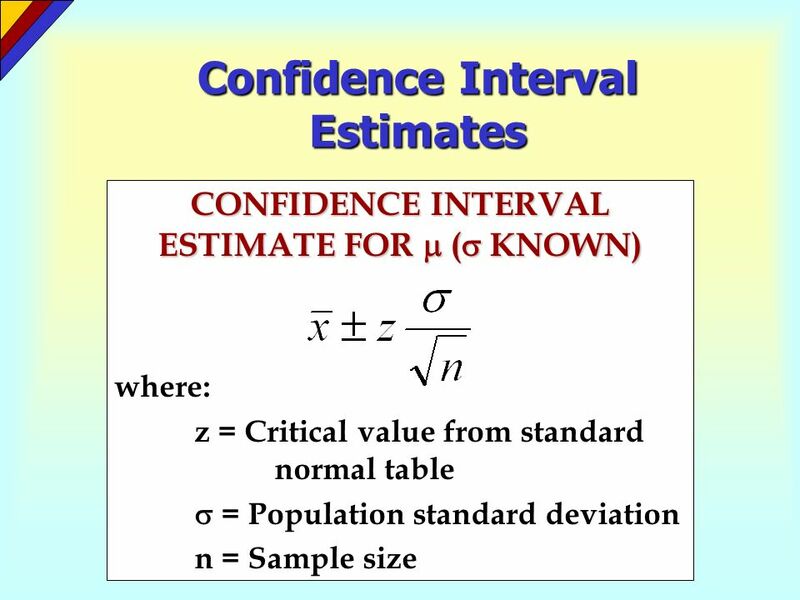 Construct and interpret a confidence interval estimate for a single population mean using both the z and t distributions. 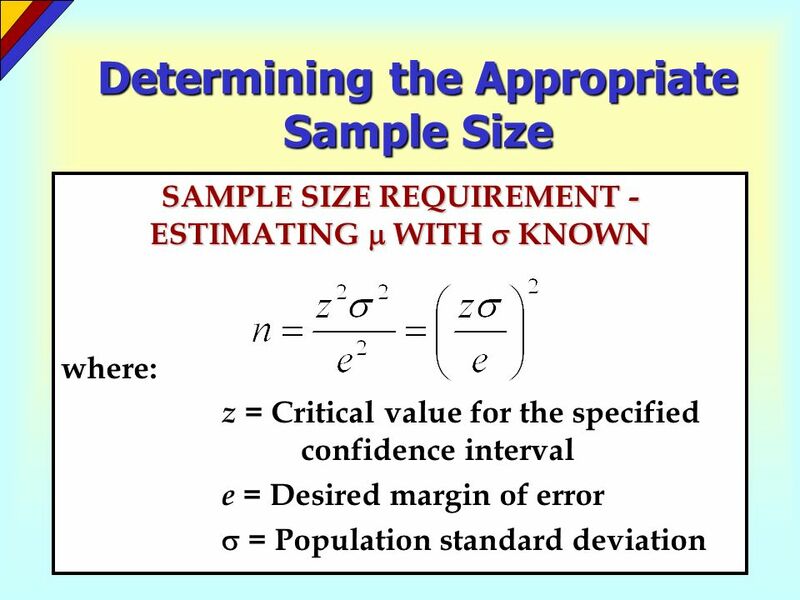 After studying the material in this chapter, you should be able to: Determine the required sample size for an estimation application involving a single population mean. 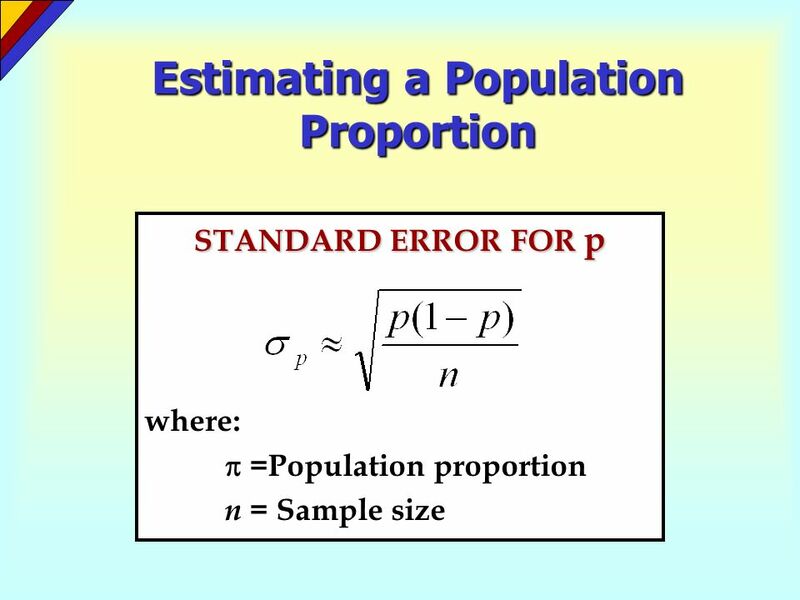 Establish and interpret a confidence interval estimate for a single population proportion. 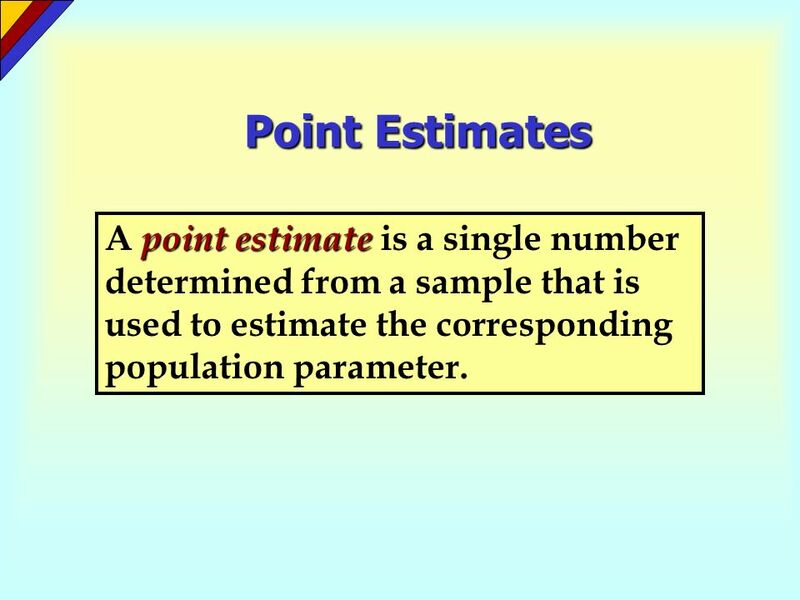 4 Point Estimates A point estimate is a single number determined from a sample that is used to estimate the corresponding population parameter. 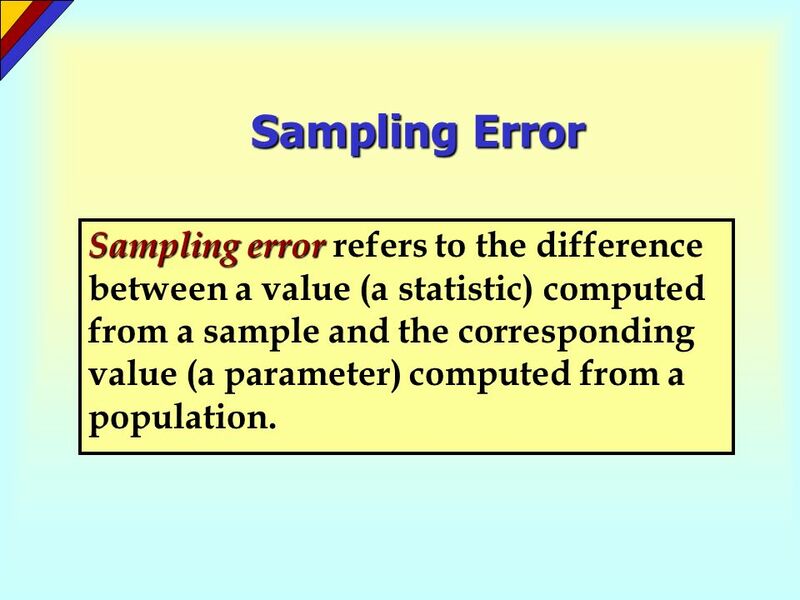 5 Sampling Error Sampling error refers to the difference between a value (a statistic) computed from a sample and the corresponding value (a parameter) computed from a population. 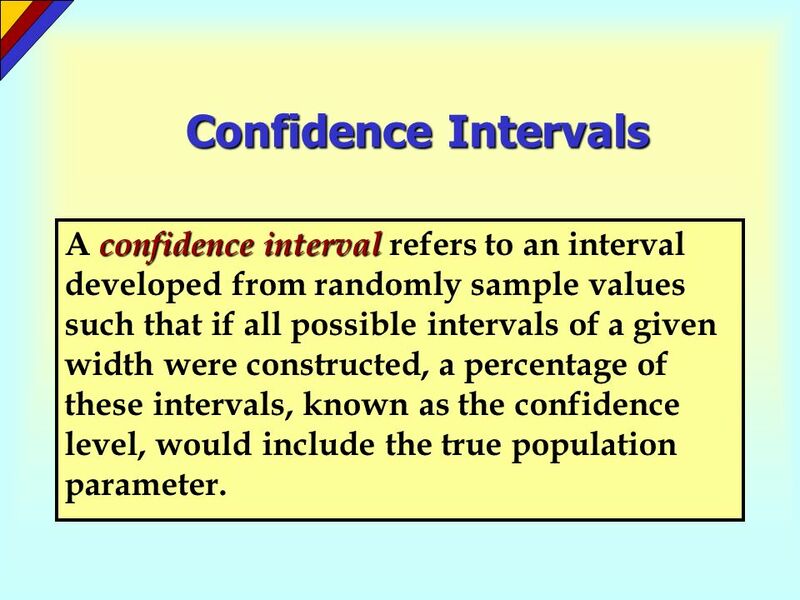 6 Confidence Intervals A confidence interval refers to an interval developed from randomly sample values such that if all possible intervals of a given width were constructed, a percentage of these intervals, known as the confidence level, would include the true population parameter. 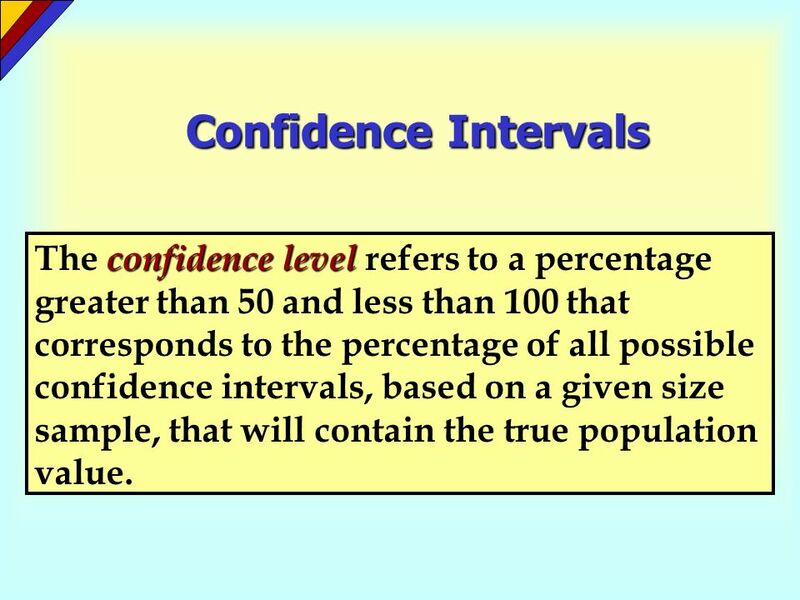 10 Confidence Intervals The confidence level refers to a percentage greater than 50 and less than 100 that corresponds to the percentage of all possible confidence intervals, based on a given size sample, that will contain the true population value. 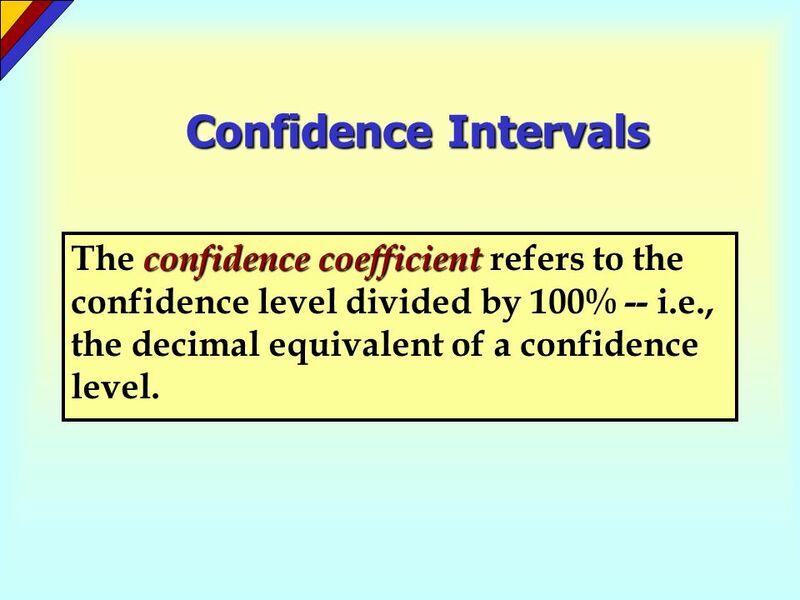 11 Confidence Intervals The confidence coefficient refers to the confidence level divided by 100% -- i.e., the decimal equivalent of a confidence level. 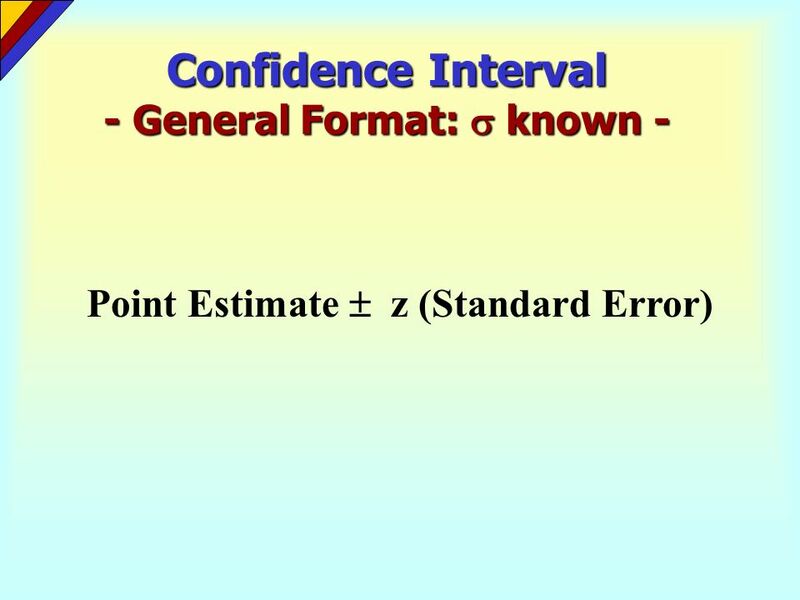 Once a confidence interval has been constructed, it will either contain the population mean or it will not. 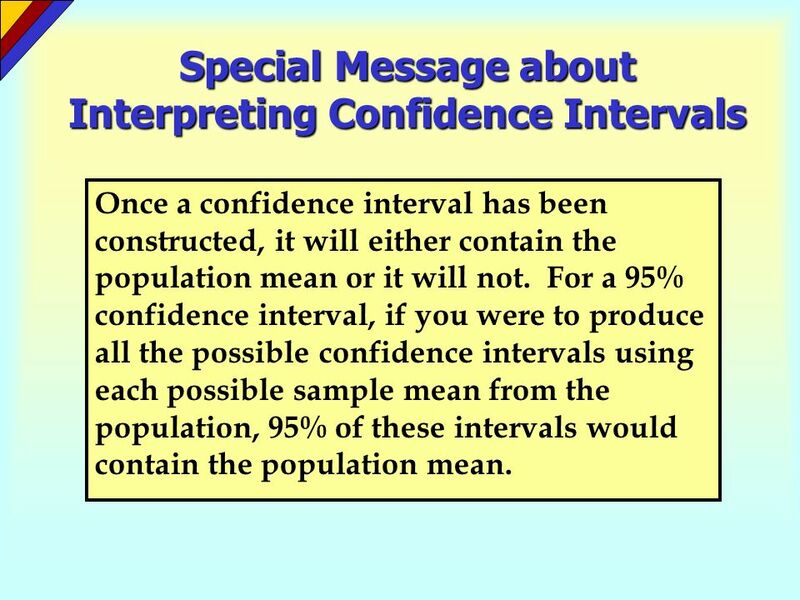 For a 95% confidence interval, if you were to produce all the possible confidence intervals using each possible sample mean from the population, 95% of these intervals would contain the population mean. 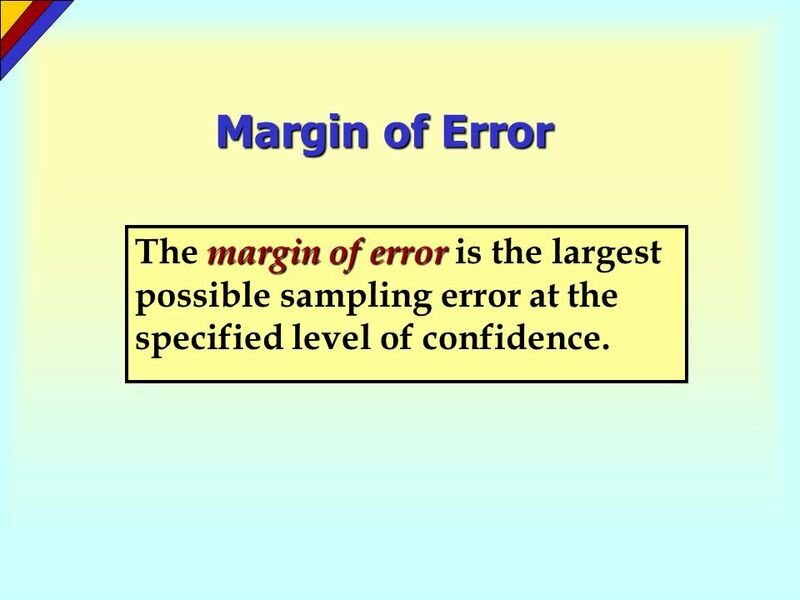 16 Margin of Error The margin of error is the largest possible sampling error at the specified level of confidence. 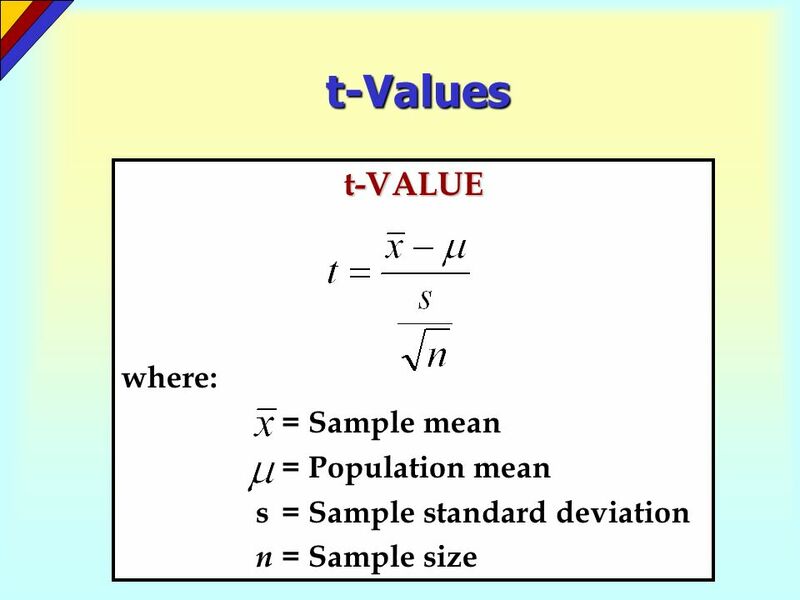 The t-distribution is a family of distributions that is bell-shaped and symmetric like the standard normal distribution but with greater area in the tails. 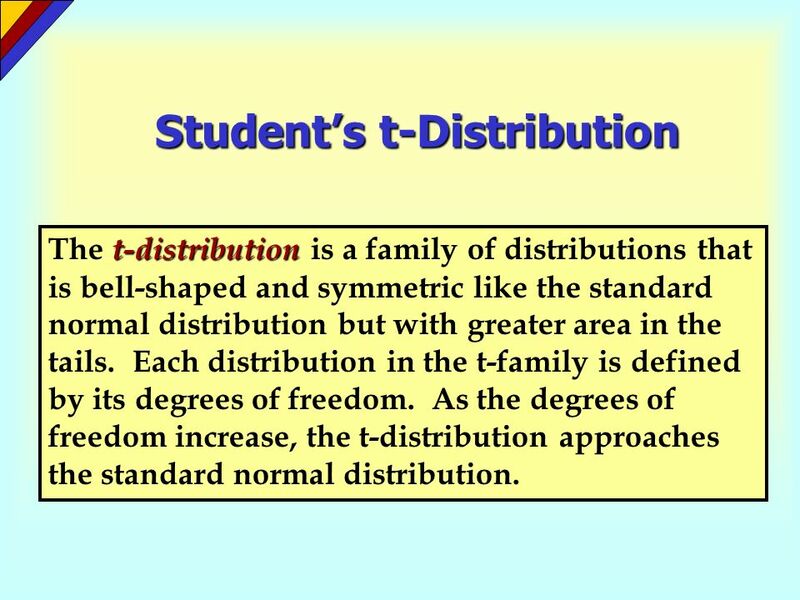 Each distribution in the t-family is defined by its degrees of freedom. 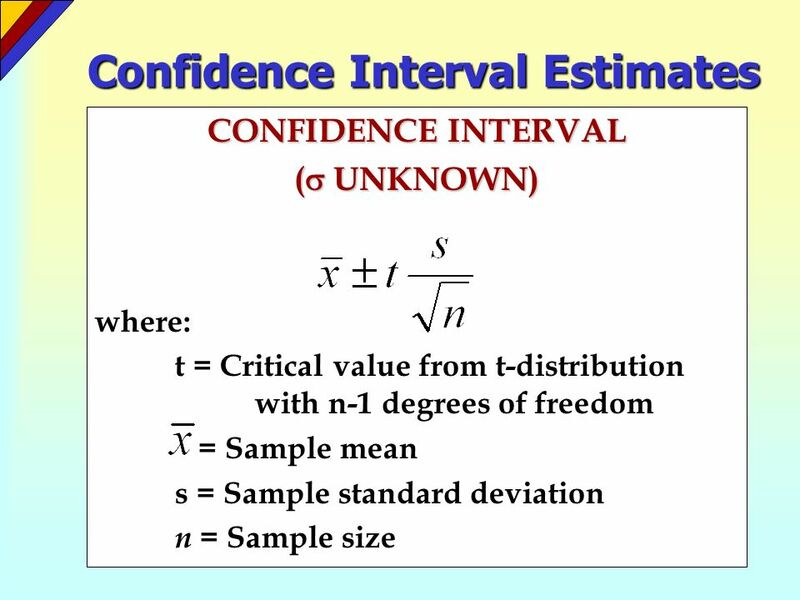 As the degrees of freedom increase, the t-distribution approaches the standard normal distribution. 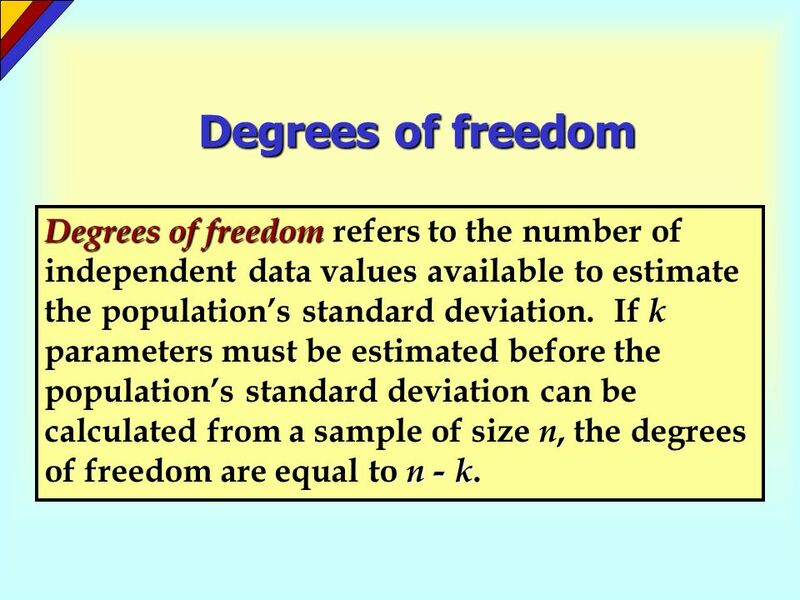 20 Degrees of freedom Degrees of freedom refers to the number of independent data values available to estimate the population’s standard deviation. 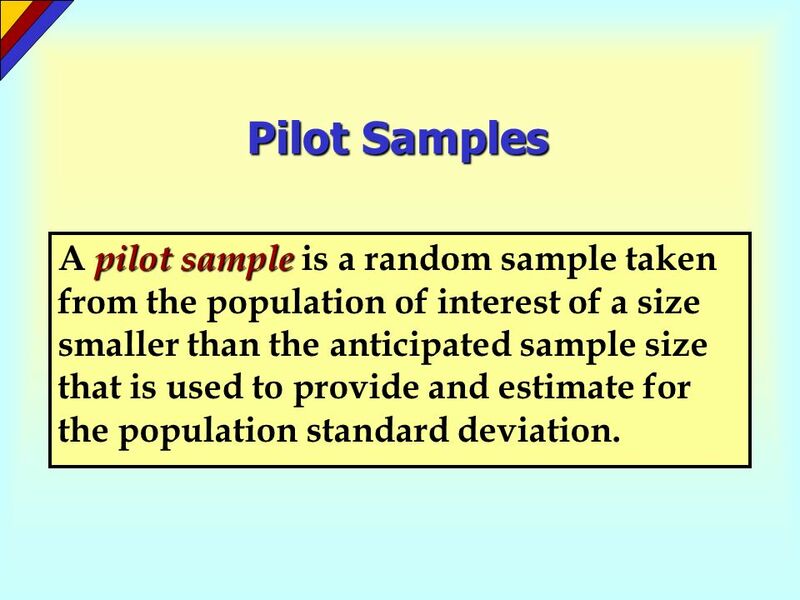 If k parameters must be estimated before the population’s standard deviation can be calculated from a sample of size n, the degrees of freedom are equal to n - k.
25 Pilot Samples A pilot sample is a random sample taken from the population of interest of a size smaller than the anticipated sample size that is used to provide and estimate for the population standard deviation. 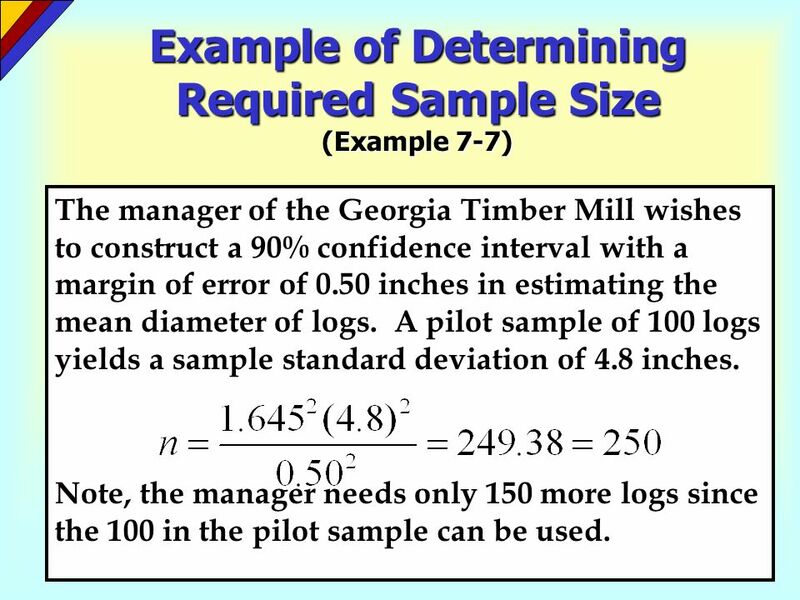 The manager of the Georgia Timber Mill wishes to construct a 90% confidence interval with a margin of error of 0.50 inches in estimating the mean diameter of logs. 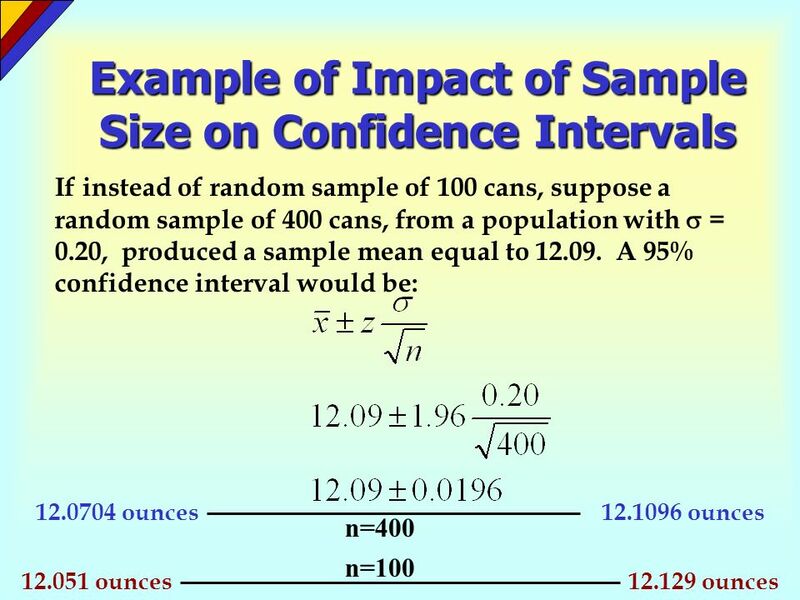 A pilot sample of 100 logs yields a sample standard deviation of 4.8 inches. 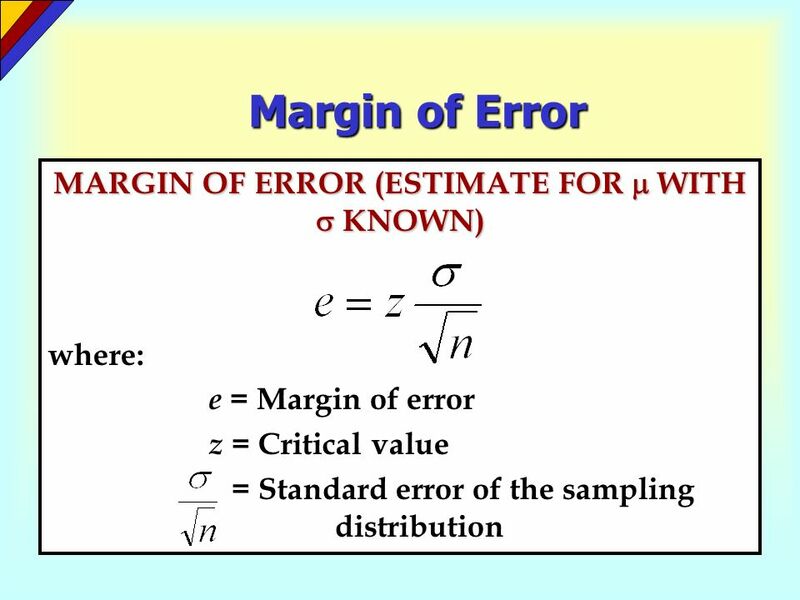 Note, the manager needs only 150 more logs since the 100 in the pilot sample can be used. 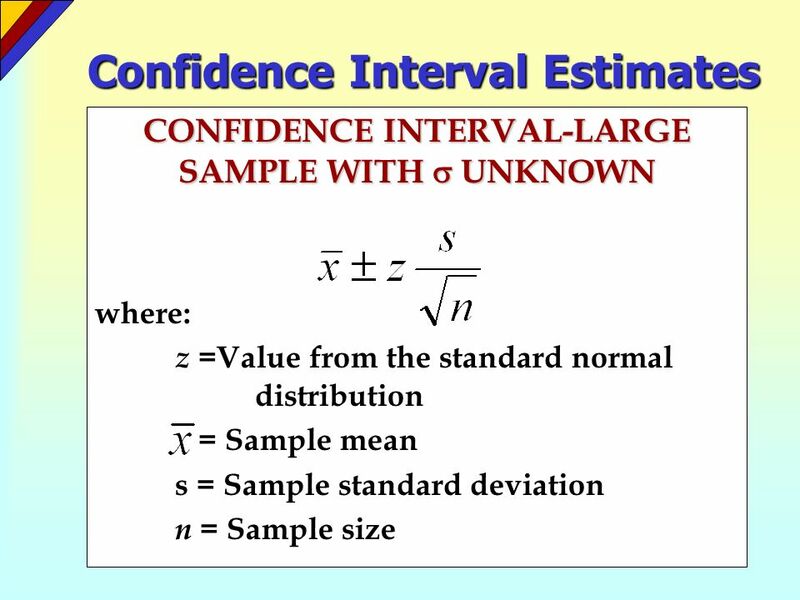 Download ppt "Estimating Population Values"
Confidence Intervals This chapter presents the beginning of inferential statistics. 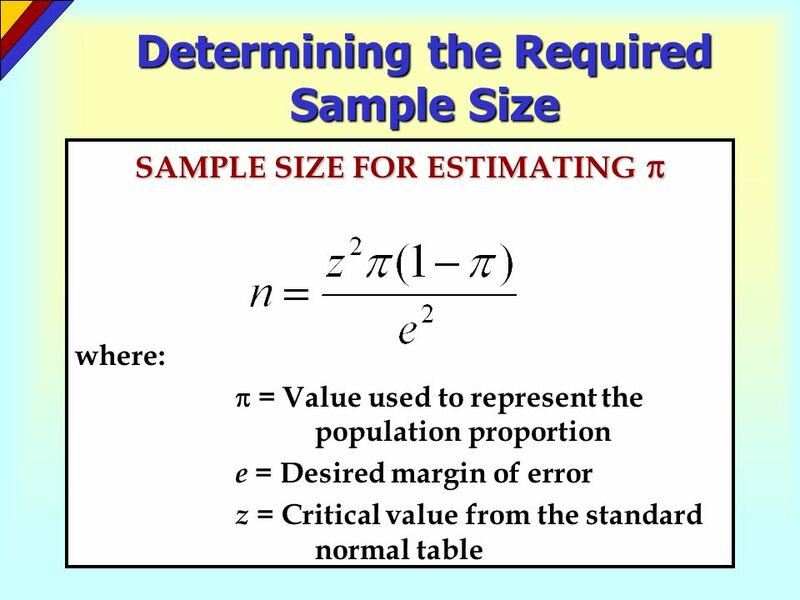 We introduce methods for estimating values of these important population. 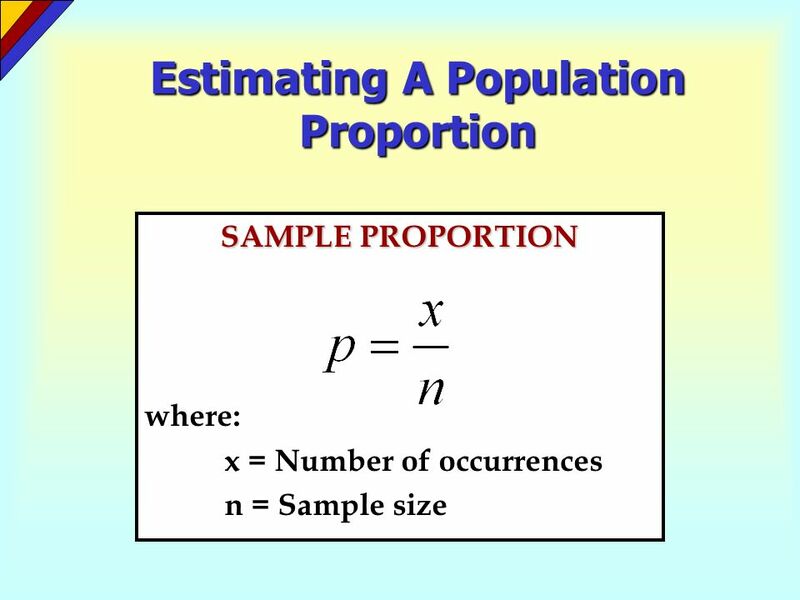 Chap 8-1 Statistics for Business and Economics, 6e © 2007 Pearson Education, Inc. Chapter 8 Estimation: Single Population Statistics for Business and Economics. 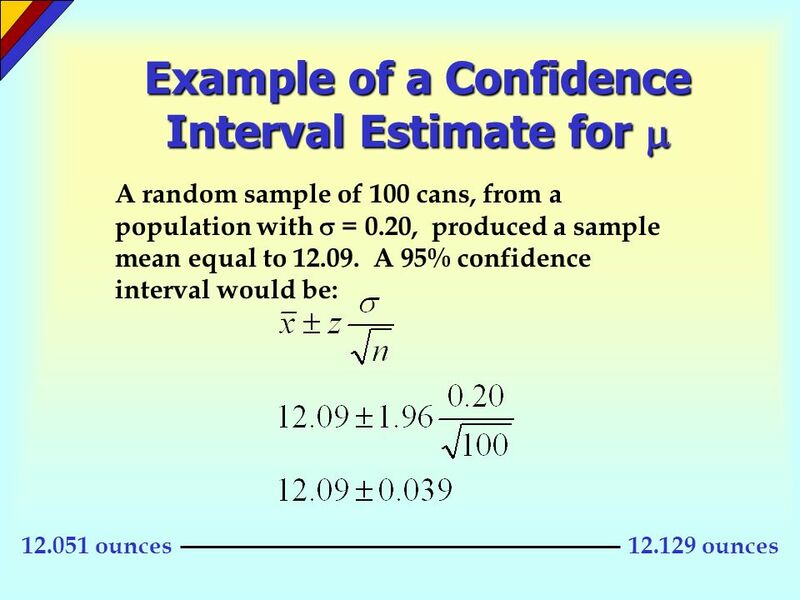 Chapter 11- Confidence Intervals for Univariate Data Math 22 Introductory Statistics. 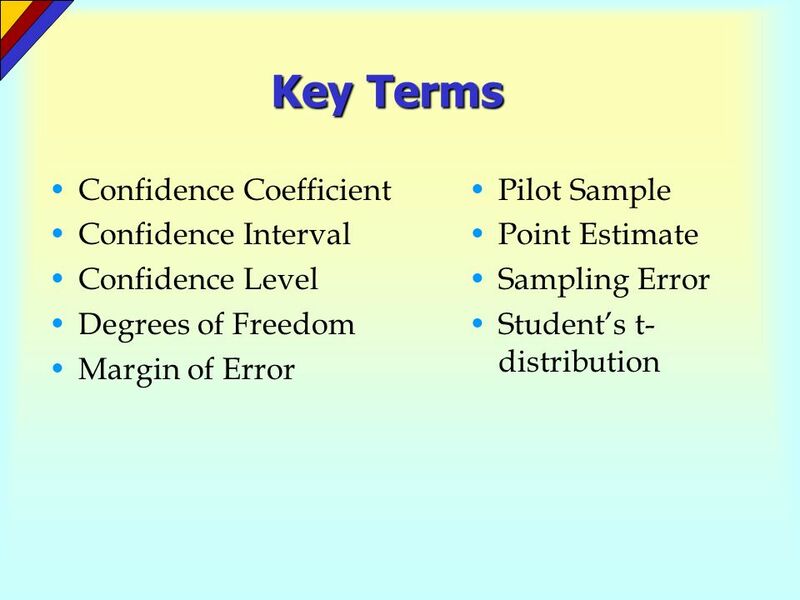 Statistics for Managers Using Microsoft Excel, 4e © 2004 Prentice-Hall, Inc. Chap 7-1 Chapter 7 Confidence Interval Estimation Statistics for Managers. 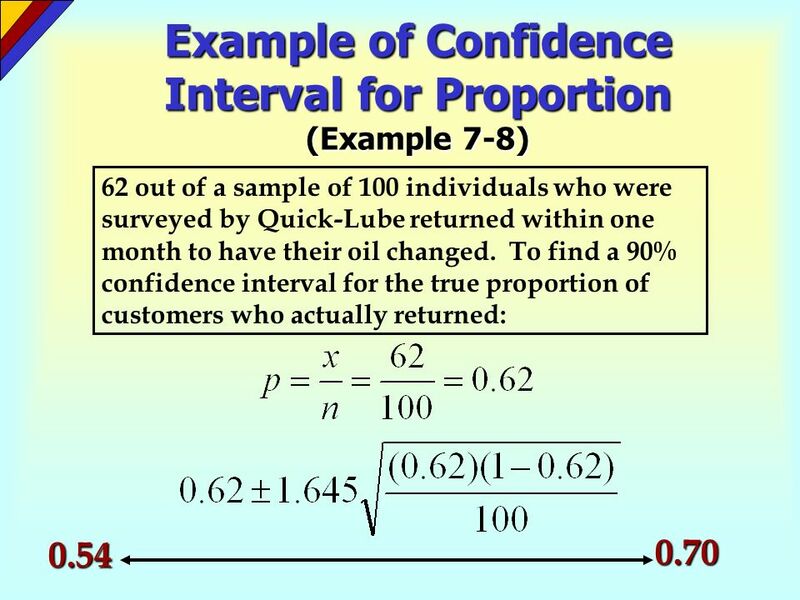 Basic Business Statistics, 10e © 2006 Prentice-Hall, Inc. Chap 8-1 Chapter 8 Confidence Interval Estimation Basic Business Statistics 10 th Edition. 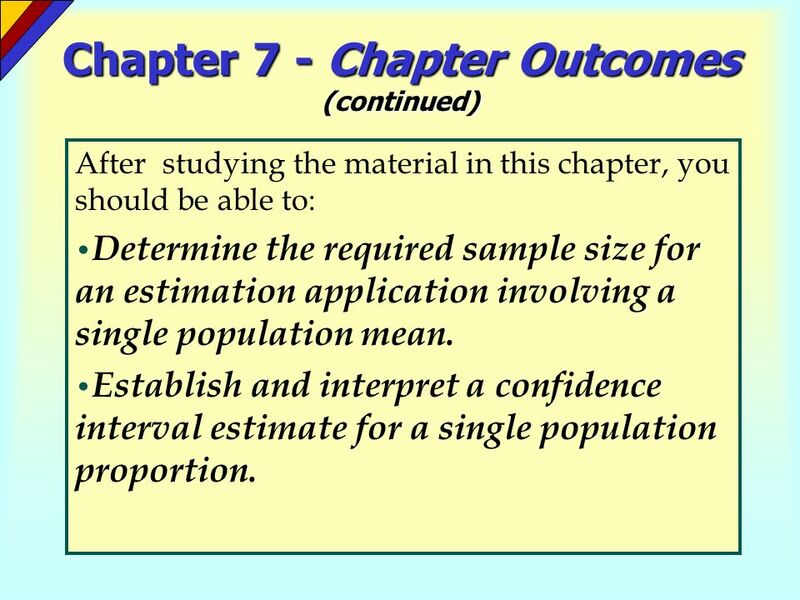 Business Statistics: A Decision-Making Approach, 6e © 2005 Prentice-Hall, Inc. Chap 7-1 Introduction to Statistics: Chapter 8 Estimation. 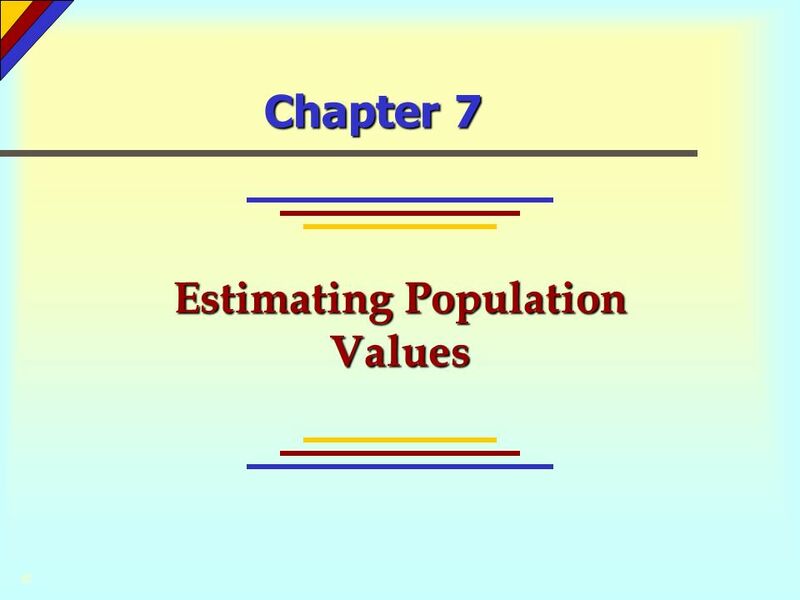 Fall 2006 – Fundamentals of Business Statistics 1 Business Statistics: A Decision-Making Approach 6 th Edition Chapter 7 Estimating Population Values. 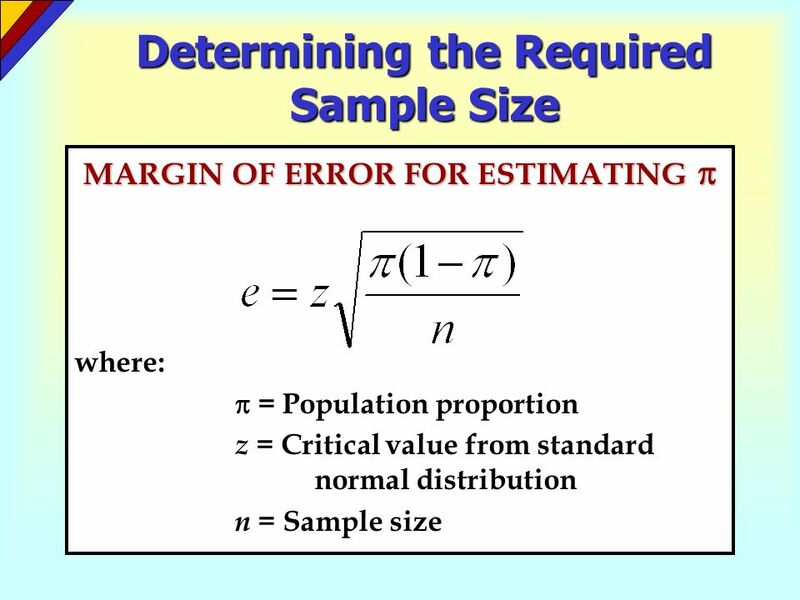 Copyright © 2010, 2007, 2004 Pearson Education, Inc. Lecture Slides Elementary Statistics Eleventh Edition and the Triola Statistics Series by. 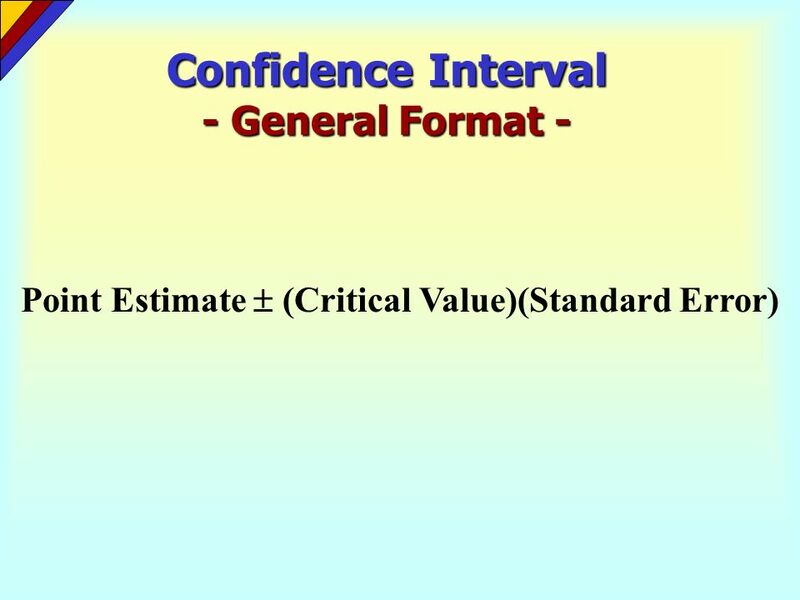 Business Statistics, A First Course (4e) © 2006 Prentice-Hall, Inc. Chap 8-1 Chapter 8 Confidence Interval Estimation Business Statistics, A First Course. 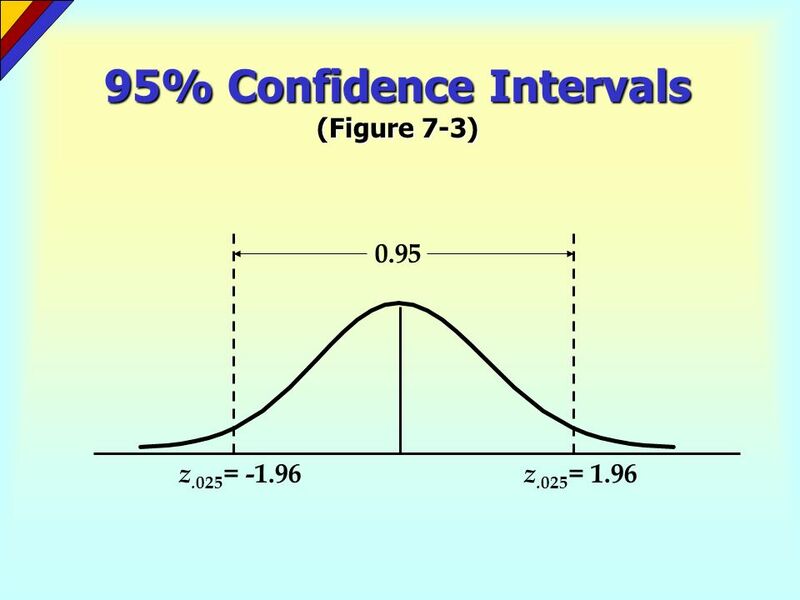 Confidence Interval A confidence interval (or interval estimate) is a range (or an interval) of values used to estimate the true value of a population. 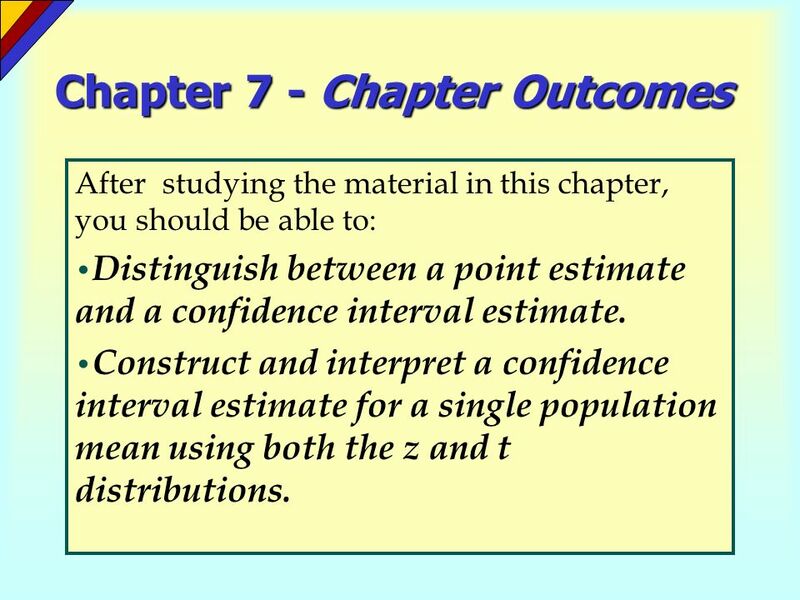 PROBABILITY (6MTCOAE205) Chapter 6 Estimation. 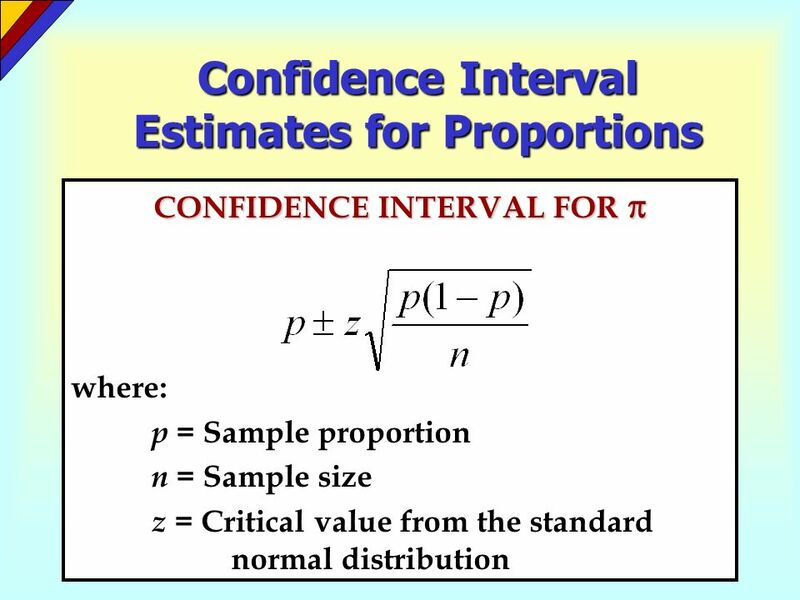 Confidence Intervals Contents of this chapter: Confidence Intervals for the Population Mean, μ when Population.